Hello there & happy new year! Hope your holidays were fantastic, or at least not too stressful. We did a lot of sleeping in & eating sugary stuff. We also tried to take advantage of the actual proper Canadian winter that descended on Vancouver for the last five weeks & counting. I am an all weather, all year round cyclist, partly because I like the challenge, but also because even when it's cold or wet, it's more convenient that transit & not painful like walking (on my arthritic hip) can be for me. But. Big but. 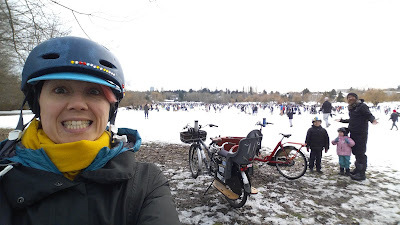 We had to seriously cut back on biking once the fluffy, somewhat dry snow transformed into packed lumpy ice alternating with slush everywhere. #VikingBiking doesn't work that well here in Vancouver's wet winters. 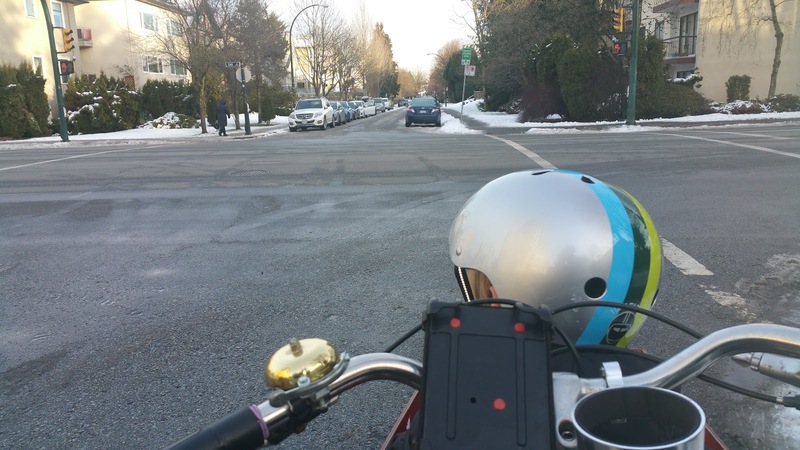 The iciness of the roads & the lack of control & respect from drivers kept even us off our bikes for most of December. #BikeToSchool every damn day. Almost. If I'd looked into the long term forecast in the beginning of December & imagined how what has turned out to be the longest cold snap in my lifetime would impact me, I'd have bought studded winter tires back then. But I didn't realize they'd be necessary until it was too late & they became a scarce commodity. Lesson learned for next year--I'm still hoping to find some near the end of the season for future use. Aaaaaaaanyway, the winter seems to be fading a bit. It's still chilly today, but we haven't had a proper dump of snow in over a week & the ice is finally melting on most sidewalks & side streets in our area. Which means we're back to riding most places again. This whole experience has really driven home how much cycling keeps me happy. I don't need to tell you about exercise & endorphins & all that--just the regular physical activity is obviously good for us. Biking keeps my body weight mostly off my hip joint, unlike walking, so it means a lot less pain, which has a huge impact on my mood. Getting out of the house, into the sun (vitamin D!) is beneficial just for a change of scenery. 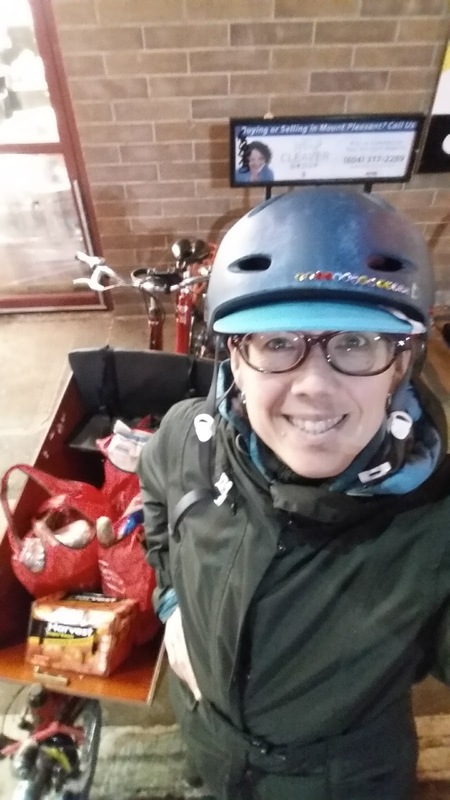 The bakfiets also makes getting groceries a lot easier--carrying bags of groceries while walking even a few blocks is a special kind of hell. For a family, it's also a lot cheaper than driving or taking transit. For all of us to take transit on an outing now costs about $12, which really adds up if you're doing it most days of the week. tThen there's the kids' happiness to think about. Though they can walk quite far for their ages, the 6km round trip to Linny's school is too much for either of them. He seemed to enjoy the 45 minute walk with me the first day back at school, then day two? Oh, the whining. Too far, too cold, too fast, too slippery. If I can just pop him into the bakfiets & zip him to school in 15 minutes, we're all happier. So here's hoping we won't have another month of actual winter & we'll get back to the balmy above zero dampness we're all used to here in Vancouver. See you on the bike paths! It's been noticeable to me how the lack of biking the past few weeks has effected my life. I don't think of myself as being in shape but I guess the little bit of biking I do is giving me a bit of exercise. Without it I'm sluggish and aimless. I ventured out one day and while I could bike for stretches I had to dismount too many times because of ice for it to be practical so I put it away. I forgot how you're so dependent when using the bus. If you're running ten seconds late you have to wait 15 minutes. Paying $2.10 just for a short trip to pick up a $4 item seems like a waste of money. Looking forward to the coming above zero weather.